The University of the District of Columbia Foundation, Inc. and the law firm of Covington & Burling are pleased to announce the availability of the Charles A. Horsky Scholarship. In 1992, Covington and Burling established an endowed scholarship in honor of Mr. Charles A. Horsky, a senior partner of the firm, to assist District of Columbia Public School students in pursuing baccalaureate degrees at the University of the District of Columbia. A native of Montana and Harvard graduate, Mr. Horsky served as President of the Harvard Law Review. His career was notable for extensive public service and pro bono activities. As chairman of the D.C. Board of Higher Education, he played a central role in the creation of UDC by guiding the merger of the City’s three degree-granting institutions: Federal City College, District of Columbia Teachers College and Washington Technical Institute. Other achievements in his career include: assistant to the Solicitor General in the Department of Justice; pro bono representation for Fred Korematsu, the famous Supreme Court case challenging the internment of Japanese Americans during WWII; Nuremberg prosecution staff member after World War II; advisor for National Capital Affairs under Presidents Kennedy and Johnson; author of The Washington Lawyer; and leader of the reorganization and accompanying valuation of Penn Central Railroad. The University of the District of Columbia is honored to be home to the Horsky Scholarship, named for such a distinguished citizen of our City. The Charles A. Horsky Scholarship award will cover the full costs of tuition, fees, books and other expenses directly related to completing the requirements of the course of study of the year awarded. In the discretion of the selection committee, taking into account the student’s financial situation, a limited allowance for commuting and living expenses may also be made. Awards will be made for one academic year. Eligibility for the award in subsequent years will be determined annually. A graduation bonus of $1,000 may be awarded to any scholarship recipient Bonus: who completes the requirements for his or her baccalaureate degree within four years with a cumulative grade point average of 3.2 or better. Applicants must be residents of the District of Columbia and graduating seniors in the District of Columbia Public Schools who have a minimum 3.0 grade point average and who intend to pursue a full-time course of study at UDC leading to a bachelor’s degree within four years. Applicants must write a 200-300 word essay on the topic “Why I am applying for the Horsky Scholarship and what I hope to accomplish with my college education.” Essays must be typewritten and double spaced or legibly handwritten. Applicants must submit three (3) letters of recommendation from responsible persons (not including family members) who know the applicant well, including a letter from the principal, counselor, teacher or community leader and copies of secondary school transcripts. Applicants must submit entries to the UDC Foundation Inc., University Applications: the District of Columbia, Bldg. 39, Rm. 301A, 4200 Connecticut Avenue, N.W., Washington, D.C. 20008 before March 1 (if this date falls on a non workday, the next business day applies). Selection: Scholarship recipients will be selected by a committee consisting of two UDC faculty members, a member of the UDC Foundation, Inc. and a representative from the law firm of Covington & Burling. 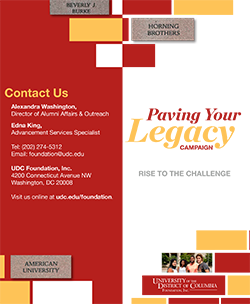 For additional information on the Charles A. Horsky Scholarship, contact UDC Foundation, Inc. on (202) 274-5312 or the scholarship counselors in your school.